Leader of the Irish Chamber Orchestra violinist Katherine Hunka and the extraordinary accordion player Dermot Dunne have been playing together since 2007. They are joined by Ireland’s most sought after and versatile double bassist Malachy Robinson to form the Far Flung Trio who, since January 2014, has been invited to perform in many prestigious venues and festivals. Their concerts include “classical” musical treasures drawn from everywhere between the Baroque and the contemporary era; South American, Klezmer and other folk musics; swing favourites and film classics. They have a proven ability to bring the highest standards of integrity to all of their diverse repertoire. Their performances are packed with musical gems and engage in the audience in an informal and entertaining way. 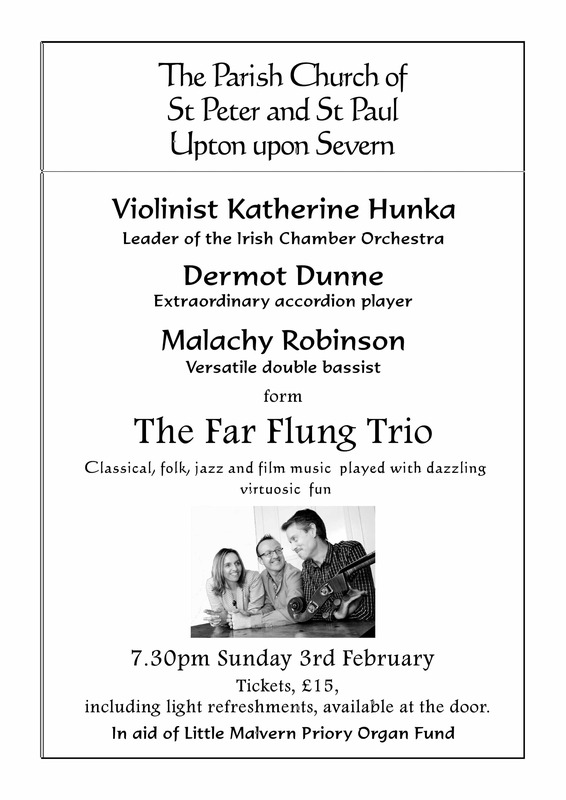 Sunday 3rd February 2019 brings an opportunity to experience the talents of these exceptional musicians who will be performing in Upton Parish Church, commencing at 7.30pm, tickets £15, including light refreshments, available at the door. In aid of Little Malvern Priory Organ Fund.